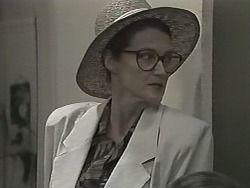 Dorothy Burke comes to see Kerry. Kerry catches Joe placing a bet on the telephone. Joe is dumbstruck and puts the phone down. JOE: Don't do that to me. Give a bloke a heart attack. KERRY: I'll do worse than that if you've been doing what I think you have. Joe tries to say he was just calling a mate but has to admit he was having a flutter - $25. Kerry says that's not a flutter, that's a new jacket for the kids or some shoes. Joe admits that the money came from the hardware account - he had a win and paid off the debt, and thought he's have another go. Kerry is upset - she's working so hard and Joe is just throwing money away. Joe is contrite but tries to reason with Kerry - a man is entitled to a few pleasures. KERRY: Well, it's a pity he had to rob his family to have them, isn't it. Christina, Caroline, Melanie and Paul are having lunch when Kelvin comes in. He knocks over a few chairs. Caroline tells Melanie that she'll have to do something about Kelvin - like making herself unavailable. Melanie goes over to talk to Kelvin. He awkwardly invites her out, but Melanie says she's having dinner with "Jose" and she's booked up for weeks. MELANIE: I am just so popular at the moment! Lochie is playing with Sky and another child - they are banging saucepans. Natasha tries to stop the banging but Kerry comes in and sees them fighting again. Joe sneaks in and Kerry is still dark at him. It doesn't help that Joe's dog lost as well. She tells Joe off for going behind her back. They start to argue, and most unfortunately Dorothy Burke comes in at that moment. She tells them off for rowing in front of the children. She takes Lochie off and tells Kerry she won't be returning. Dorothy can't start her car again. 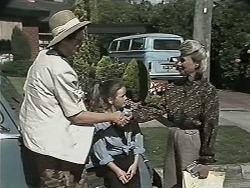 Helen comes up the road and Dorothy introduces herself. She asks to use Helen's phone to call roadside assistance. Christina has redone a display which looks good. 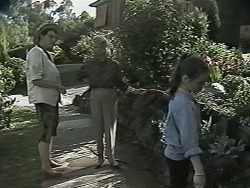 Christina tells Caroline that the stock is a bit run down and she has ideas on how to improve things. 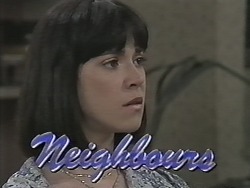 She reels off a list of ideas and Caroline suggests that she talks to Paul about them. Christina wants Caroline to talk to him first. 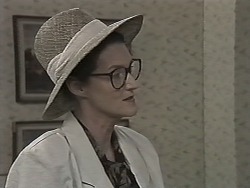 Over a cup of tea, Dorothy is complaining to Helen about Kerry, who is surprised. Dorothy goes on to say that children should be cared for in their own homes. She explains that she was a teacher, but decided to have a leave of absence and travel. She goes on to say sanctimoniously that there's no such thing as day-care in Nepal - the extended family help out. One reason she's returned to Australia is to give Ryan and Lochie that sense of family. Caroline mentions Christina's ideas for the gift shop to Paul. Paul gets the impression that the ideas are Caroline's own, and has to rush off before Caroline can set him straight. Joe is slumped at the bar when Melanie comes in. He tells her about his row with Kerry and how miserable he is. Just then Kelvin comes in and Melanie kisses Joe, calling him "Jose"
Kelvin tells Melanie that he doesn't care about her other men - he thinks Melanie is beautiful. But he'll never bother her again. He walks into the door on his way out. Kerry has put the other kids down for a nap, leaving just her and Natasha. Natasha is pleased that Lochie isn't coming back again. Joe comes in and apologises to Kerry. He also promises not to do any more betting and gives her some flowers. KERRY: Where did you get those from? JOE: Now before you start, they didn't cost a cent. I pinched them out of Robbo's garden. Paul comes in and asks Christina how sales have been. They haven't been very good. Paul says that he likes the ideas for the gift shop Caroline told him and they should go ahead with them. Christina is pleased. Melanie comes in looking depressed. She feels really bad about how she's treated Kelvin. She says he was so sweet when he talked to her earlier and she feels so guilty for breaking his heart. Dorothy and Lochie drive up (in a different hire car this time). Dorothy has come to thank Helen for her help that afternoon. She'd like to return the favour and offer Helen afternoon tea some time. She heads off to see Kerry. Dorothy tells Kerry that she's spoken to Lochie's mother - and she's happy for Kerry to carry on looking after Lochie (or Tiffany as Dorothy calls her). Kerry assures Dorothy that there's no reason for her to worry. Dorothy isn't convinced, and tells Kerry she's spoken to the Department of Community Services to come and do an inspection! DOROTHY: You do realise you need a licence to care for more than four children? I shouldn't be surprised if they close this little "business" of yours down!